Like its English cousin, the American Foxhound is an excellent hunting dog developed for club hunting in packs. 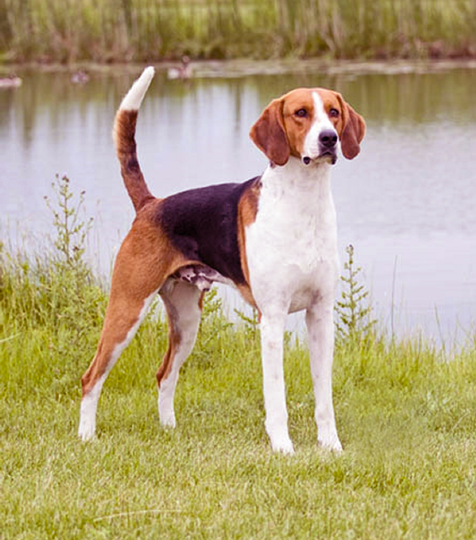 However, the American Foxhound is lighter on its feet and taller than its European counterpart and faster in the chase! The American Foxhound is a sweet, affectionate breed that is calm while indoors, yet loves to run outdoors. This breed has a short, smooth coat and is considered an average shedder who requires little grooming. Brushing its coat with a firm-bristle brush is recommended due to their coat. The American Foxhound is also known for its musical bay and its tones have enchanted owners for years. Owners are even said to be able to distinguish their Foxhound’s individual “voice" in large packs. Like other hounds, the American Foxhound can be stubborn and prey-minded, especially once they pick up the scent of prey. However, when properly trained, your Foxhound can be quite affectionate with people. They are very tolerant of strangers, so they don’t generally make good guard dogs, but they are great with children and other medium to large dogs. You must be sure to socialize your Foxhound with people often and from a young age. Human socialization will prevent a strong pack bond (if you have other dogs) from taking precedence over the family bond. You want your Foxhound to respond to you as the pack leader, not another dog. Foxhound can also live in harmony with smaller pets, such as cats, rabbits, or birds. However, you must introduce the small pet to your Foxhound at an early age, though it’s not advised to leave a small pet alone with a Foxhound as they are bred for the chase. Overall, the Foxhound is a sweet dog with a lot of patience, but bred for activity! They are not a great choice for new dog owners, especially those living in urban areas. This is an intelligent, active breed that will find some way to occupy itself, whether that means tearing up the house or getting into other shenanigans when left alone for too long.